It has been suggested that Supervised agricultural experience be merged into this article. (Discuss) Proposed since January 2019. National FFA Organization is an American 501(c)(3) youth organization, specifically a career and technical student organization, based on middle and high school classes that promote and support agricultural education. It was founded in 1925 at Virginia Polytechnic Institute, by agriculture teachers, Henry C. Groseclose, Walter Newman, Edmund Magill and Harry Sanders as Future Farmers of Virginia. 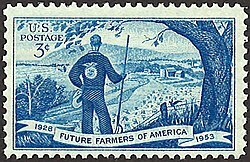 In 1928, it became a nationwide organization known as Future Farmers of America. In 1988 the name was changed to the National FFA Organization, now commonly referred to as FFA, to recognize that the organization is for those with diverse interests in the food, fiber and natural resource industries, encompassing science, business and technology in addition to production agriculture. Today FFA is among the largest youth organizations in the United States, with 669,989 members in 8,630 chapters throughout all 50 states, Puerto Rico, and the Virgin Islands. FFA is the largest of the career and technical student organizations in U.S. schools. The organization holds a congressional charter under Title 36 of the United States Code. FFA functions within the three-circle model of agricultural education as a student leadership organization that complements a student's classroom/laboratory instruction and supervised agricultural experience program. FFA members can compete in Career Development Events (CDE) that cover job skills in everything from communications to mechanics. Some events allow students to compete as individuals, while others allow them to compete in teams. These competitions can happen at a local or district level, state level, and on the national level. Official colors of the FFA are National Blue and Corn Gold. United States Secretary of Agriculture Tom Vilsack (3rd from right) stands with five former National FFA Officers in 2011. FFA is represented at several different levels across the nation; FFA administration may change from state to state. The basic levels are the national level, serving all of the United States of America, Puerto Rico and the U.S. Virgin Islands; the state level, serving an individual state association; and the chapter level, serving a school or set of schools in an area. By definition, there can be three types of chapters at the secondary level, they are middle for middle school, junior for ninth grade and senior which can be either tenth through twelfth or ninth through twelfth depending on the school. Other levels include districts, subdistricts, sections, regions, areas, and federations. FFA was created to serve high school students, and has moved into middle schools where membership may begin as early as age 12, allowing members to become active earlier and stay active for longer. Each chapter is chartered as part of the state association and national organization. Collegiate chapters exist as well. Most states hold FFA conventions at least once annually, where members gather to compete, be recognized for awards, attend leadership workshops, debate organizational issues in a delegate process, and more. Nationally, the National FFA Convention & Expo is held once a year in the fall. It was held in Kansas City, Missouri, from 1928 to 1998. The convention moved to Louisville, Kentucky, in 1999 before moving again in 2006 to Indianapolis, Indiana. Louisville again hosted the national convention from 2013 to 2015. FFA announced in July 2015 that the national convention would be hosted in Indianapolis each year from 2016 to 2024. President — Stationed by the rising sun, a token of a new era in agriculture. Presides over meetings. Vice President — Stationed by the plow, the symbol of labor and tillage of the soil. Presides over meetings in the absence of the president. Secretary — Stationed by the ear of corn, to keep a record of all meetings and correspond with other secretaries wherever corn is grown and FFA members meet. Treasurer — Stationed by the emblem of George Washington, to keep an accurate account of receipts and disbursements just as Washington kept his farm accounts, carefully and accurately. Reporter — Stationed by the Flag, strives to inform the public in order that every man, woman, and child may know the FFA is a national organization that reaches from the state of Alaska to the Virgin Islands and from the state of Maine to Hawaii. Sentinel — Stationed by the door, to ensure the door is open to all, care for the meeting room and paraphernalia, strives to keep the meeting room comfortable as well as assists the president in maintaining order. Parliamentarian — Stationed by a copy of Robert's Rules of Order. Historian — Stationed at the scroll or chapter scrapbook. Student Advisor — Stationed by the owl or the key. Each officer is an agricultural student and holds responsibilities needed to serve, and are elected each year by members at the respective levels. At the national level, the organization has student-held positions of president, secretary, and vice president for each of the four administrative regions (Eastern, Southern, Central, and Western). Odessa Oldham, of Casper College in Wyoming, explained her role in the National FFA Organization to the United States Department of Agriculture, as part of its Native American Indian Heritage Month celebration in Washington D.C., in November 2011. The most recognizable symbol of the organization is the blue corduroy FFA jacket that is worn by current FFA members. The back of the jacket features a large FFA emblem just underneath the name of each FFA member's state. The name of the local FFA chapter, district, region or area is embroidered below the emblem. The front of the FFA jacket features a smaller FFA emblem on the left chest and the FFA member's name and sometimes, if applicable, office and year on the right chest. FFA members are required to wear the FFA jacket as part of official dress while participating in all official organization activities. The FFA jacket was created to be worn by the Fredericktown Band of the Fredericktown FFA Chapter by Dr. Gus Lintner. It was adopted in 1933. The color of the jacket's corduroy has ranged from shades of blue to shades of purple through the years. In 2004, the National FFA Organization worked with a supplier in North Carolina to set a new standard for the blue corduroy by using samples from archived FFA jackets. The jacket's color standardization was accompanied by a restoration of the embroidered FFA emblems and fit corrections led by Clemson University's Apparel Research Center. The improved FFA jacket, produced in both Van Wert, Ohio and South Vietnam, was first made available in August 2005. Currently, all lettering, embroidery and finishing of FFA jackets is completed by Universal Lettering Company in Van Wert, Ohio. FFA members are required to wear official FFA dress while participating in official organization activities. The National FFA Organization recently updated its bylaws, stating that members may choose to identify however they choose in regards to official dress, in order to include transgender as well as gender non-conforming individuals within the organization. For females, official dress consists of a black skirt (black slacks may be appropriate for traveling and outdoor activities), a white collared blouse, an official FFA blue scarf, black dress shoes with a closed heel and toe, black nylon hosiery, and an official FFA jacket zipped to the top. Male official dress includes black dress pants, a white dress shirt, an official FFA tie, black dress shoes with a closed heel and toe, black socks and an official FFA jacket zipped to the top. FFA members earn metal pins that signify achievement within the organization. These pins can be placed on the front of the FFA jacket, however, official guidelines state that no more than three pins may be worn at one time. The pins are to be placed beneath the FFA member's name on the right chest and can recognize highest degree, highest office, and/or highest award in that order from left to right. Two exceptions exist within pin placement guidelines. When an FFA member earns a State FFA Degree or American FFA Degree, the award keys should be worn above the name on right chest or attached to the FFA jacket with a standard key chain, and no other pins should accompany these. Former FFA emblem in use until February 2015. The FFA Emblem: Cross section of the ear of corn: represents unity. Where ever you live in the United States, corn is grown everywhere. Rising Sun: signifies progress. It represents that tomorrow will always bring a new day. Plow: signifies labor and tillage of the soil. It also shows the historic foundation of our country's strength. Eagle: symbolizes freedom and our ability to explore the new agriculture world. Owl: represents knowledge. Long recognized for wisdom and knowledge. Agriculture Education and FFA: symbolizes the combination of learning and leadership. The FFA Creed: The creed was written by Erwin Milton "E.M." Tiffany of Lyndon, Kansas and adopted at the 3rd National FFA Convention. It was revised at the 38th and 63rd National FFA Conventions by the assembled delegate body. It is recited by new members to the organization to reflect their growing belief in agriculture and agricultural education. The FFA Creed also must be memorized and recited to earn the Greenhand Degree. FFA Career Development Event (CDEs) are contests that members compete in to test their skills learned through agricultural education instruction. They vary at the different levels of FFA, and some are contested only at certain levels and certain states, districts, areas or federations. Steve Doocy, network-television personality on the Fox News Channel and a best selling author. Co-host of Fox & Friends in the mornings. 2006: National FFA Foundation receives first $1 million contribution from Ford Motor Company. 2009: FFA celebrates 40 years of women in the organization. 2010: FFA members earn a record 3,449 American FFA Degrees. 2011: National FFA Alumni Association celebrates its 40th anniversary. 2013: Official FFA Jacket celebrates 80th anniversary. 2015: National FFA celebrates 50 years since NFA merged with the FFA. 2017: National FFA elects first Woman African-American National President, Ms. Breanna Holbert from the State of California. ^ "FFA Mission and Motto". National FFA Organization. ^ a b c d e f g h "Form 990: Return of Organization Exempt from Income Tax". Future Farmers of America. Guidestar. December 31, 2015. ^ "Future Farmers of America State Associations & Local Chapter". Exempt Organizations Select Check. Internal Revenue Service. Retrieved 1 May 2017. ^ "Our Leadership". National FFA Organization. Retrieved 17 October 2014. ^ "National FFA Organization and National FFA Foundation Name Mark Poeschl Chief Executive Officer". National FFA Organization. Retrieved 29 July 2016. ^ "Our Leadership". National FFA Organization. Retrieved 1 May 2017. ^ "David Townsend: Bio". National FFA Organization. Retrieved 1 May 2017. ^ "Who We Are". National FFA Organization. Retrieved 17 October 2014. ^ "Future Farmers to Meet Aug. 6-9: 1,000 Young Virginians Will Compete for Honors at Blacksburg". The Washington Post. 3 August 1929. p. 18. ^ "FFA History". National FFA Organization. p. 2. ^ "Statistics". National FFA Organization. ^ "36 USC § 70901 – Organization". Federal Charter; Future Farmers of America is a federally chartered corporation. Legal Information Institute; Cornell Law School. ^ "School-Based Agricultural Education" (PDF). National FFA Organization. ^ "Career Development Events". National FFA Organization. ^ "National FFA Organization - Home". www.ffa.org. Retrieved 28 March 2018. ^ "National FFA Organization Announces National Convention and Expo Coming to Indianapolis 2016-2024". National FFA Organization. Retrieved 29 July 2016. ^ a b c d "FFA Official Dress". National FFA Organization. ^ Langstaff, Dave. "A Brief History of The FFA Jacket and The People Who Make It". Universal Lettering Company. Retrieved 2010-06-05. ^ "FFA Official Dress PDF" (PDF). National FFA Organization. ^ a b 105th U.S. Congress (August 12, 1998). "Public Law 105-225" (PDF). National FFA Organization. p. 6. ^ "FFA Facts". Code of Ethics, Creed, Emblem, Mission, Motto, Name, Official Colors, Official Dress, Salute. Minnesota FFA Association. Retrieved 2010-06-05. ^ a b "FFA Career Development Events (CDE)". National FFA Organization. Retrieved 2013-03-11. ^ "FFA Supervised Agricultural Experience (SAE)". National FFA Organization. Retrieved 2013-03-11. Wikimedia Commons has media related to National FFA Organization.